Yesterday I attempted (twice) to make a butterscotch pie from a recipe written by a famous lifestyle maven. While I fully recognize that the maven and her test kitchen chefs likely possess culinary skills that surpass my own, I also sincerely believe there is something wrong with her recipe, in quantity or in process. Perhaps some step was left out, or there was an instruction regarding the temperature of an ingredient that no one thought to include. Either way, I gave it two good tries and ended up having to throw away a burnt-caramel-encrusted wooden spoon. Fortunately, I had a pre-baked crust and four egg yolks waiting in the wings during the butterscotch disaster, so when I consulted my trusty Better Homes & Gardens 25th Anniversary Cookbook and discovered that vanilla cream pie called for both items, I knew it was meant to be. I’d never tempered eggs before, but with Mike’s help all went well. The end result is, quite seriously, one of the best pies I’ve ever had. So take that, lifestyle maven. The BH&G also has a butterscotch recipe, so stay tuned for that sometime soon. Line a 9-inch pie plate with crust, trim edges, and prick bottom with a fork. Line crust with parchment and fill with dried beans or pie weights; bake for 15 minutes, then remove the beans/weights and parchment and continue baking for another 15 minutes, until edges are golden brown. Allow crust to cool completely before filling. Place egg yolks in a large glass measuring cup and beat lightly; set aside. Using a measuring cup will make it easier to pour the tempered egg yolk mixture back into the pan of filling later. In a medium saucepan, whisk together sugar, corn starch, and milk until very well combined. Cook until thickened and bubbly, stirring frequently. Once bubbles form, cook and stir 2 minutes more. Remove from heat and slowly pour about 1 cup of the filling mixture into the egg yolks, whisking constantly to temper. Pour egg yolk mixture back into the pan of hot filling and bring to a very gentle boil. Cook and stir 2 minutes more. Remove from heat and stir in butter and vanilla extract until very well combined. Pour filling into cooled pre-baked crust and gently press plastic wrap on the top of the filling. Refrigerate for at least 3 hours before serving; my pie was refrigerated overnight. 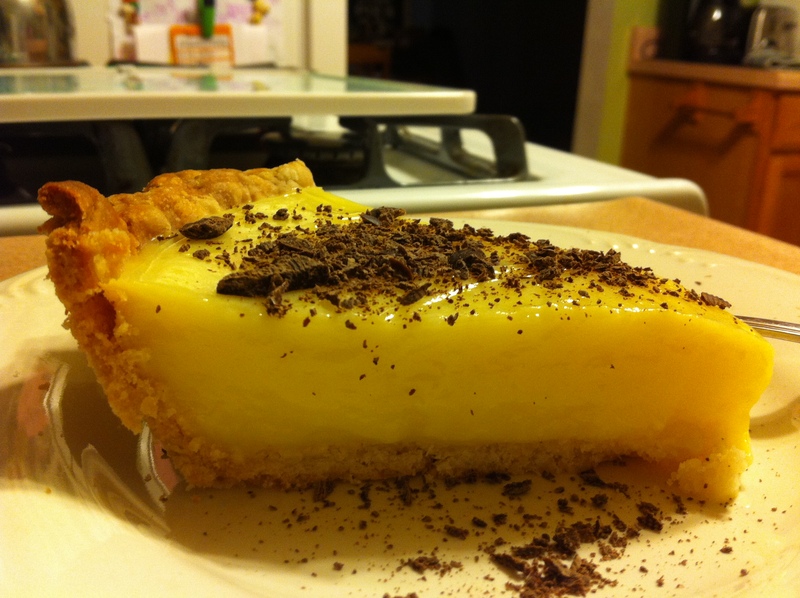 If desired, chop or grate dark chocolate Hershey’s Kisses and sprinkle over the top of the pie before serving. Whipped cream would also be a great topping idea. Wondering what to do with four leftover egg whites? Use three of them for coconut macaroons and the remaining white to make a half-batch of cocoa meringues.